Similar to glass, mirrors are definitely one of the most interior friendly solutions. 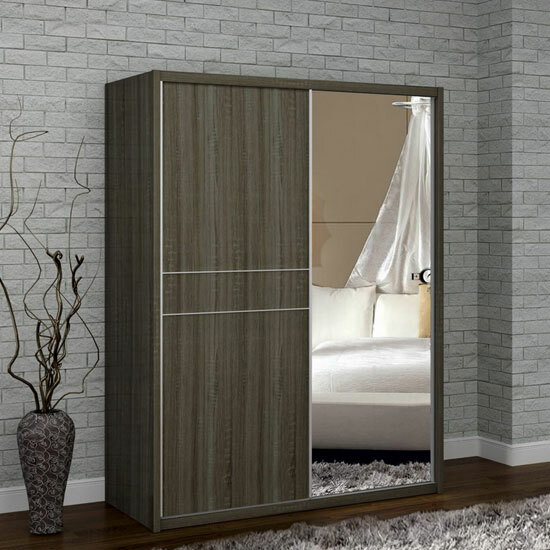 They can be combined with the widest range of furniture items, so if you already have part of your bedroom decoration finished, a mirrored wardrobe or a cabinet will easily fit into your environment – no matter if it is traditional or modern. In a combination with non-mirrored furniture, mirrors can create a very stylish contrast. If you are trying to stick to neutral, traditional decorative patterns, you can combine it with soft wood. If, on the contrary, you are going for a very modern look in your bedroom, you should better choose glossy MDF furniture – it may even feature some metal inserts for greater contrast. Mirrors are bright, and they create a very stylish, light atmosphere in any room. If your bedroom is normally filled with sunlight, mirrored furniture will look astonishing there. Plus, mirrors are visually compact and can act as additional functional items in your room – especially if it is mirrored wardrobe we are talking about. Even if you choose one mirrored furniture piece for your bedroom, you will not have to worry about any matching items. As it was already mentioned, mirrors are very interior friendly, and you will not be forced to look for additional items to make your interior complete. Yet, the best part is maintenance. Fine quality mirrors are thick and not so easy to break or scratch. Obviously, they are also resistant to water and can be installed even in the most humid environments. Cleaning the furniture will not take you long either – just wipe with any glass cleanser once a month, and it will look bright as new for decades. Yet, despite all of the advantages of mirrored bedroom furniture, you should be careful installing too many mirrored items in your room – especially if your space is limited. Even though it looks quite compact, the abundance of shiny furniture can create cluster, so a couple of units should probably be enough. You should also note that furniture featuring a lot of mirrors can be rather costly. Fortunately, it is always possible to save some money if you shop in big furniture stores. Huge retail chains usually can afford keeping their prices appealing to the general audience, so if you do not want to spend a fortune on bedroom decoration, try looking for a store with established reputation and impressive product selection.